I particularly enjoyed the tomato sauce/unpickled giardiniera, though. Sweet and hot, cooked into a thick and chunky paste, it could be an ideal condiment for almost any hot sandwich. Note: Instead of in sandwiches, the meatballs and vegetables can also be served alone or over another starch, such as rice or orzo pasta. Combine milk and Slap Ya Mama Cajun Gumbo Dinner Mix in a large bowl, and allow to sit for at least 20 minutes for the gumbo mix to rehydrate. Preheat oven to 425°F. Prepare a baking sheet with a layer of parchment paper and a layer of cooking spray. Add the remaining meatball ingredients to the bowl with the gumbo mix and mix together, only until combined. Do not overwork the meat mixture. Add more breadcrumbs if mixture is too moist. Using a 2 Tablespoon measuring spoon, scoop the meat into balls and place on the baking sheet, making sure the meatballs do not touch. Bake the meatballs for 8-10 minutes, until almost cooked through. Then turn the oven to broil for 2 minutes to toast the exterior; flip the meatballs and broil 1-2 minutes longer to toast the other side. Meanwhile, for the sauce, combine the tomatoes, vegetables, oregano and sugar in a pot and bring to a boil. Reduce the heat to medium-low, cover and allow to simmer 20-30 minutes. Stir regularly, smashing the tomatoes against the pan wall occasionally to break them up. The vegetables' liquid should be almost completely evaporated. If not, continue to simmer until you achieve the desired consistency. 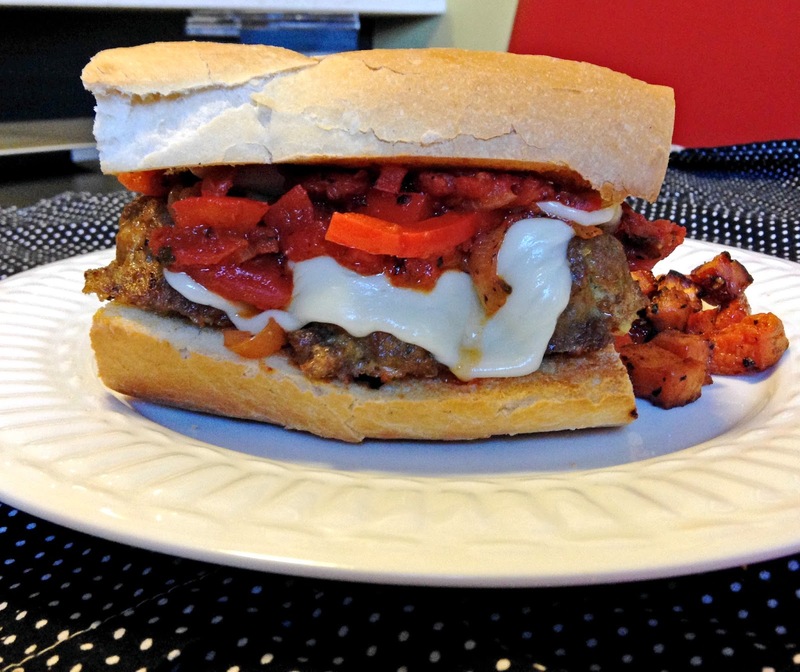 Assemble the sandwiches with a layer of sauce, the meatballs, provolone cheese and more sauce. Return the sandwiches to the warm oven to melt the cheese, if desired.